The floating dredge "Ben" has completed the first cut through the bay for the opening of the commercial boat channel from Laguna Madre to the turning basin on the west side of town. 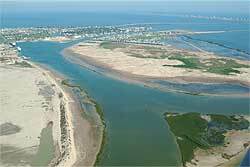 The first cut gave a depth of six feet from the main ship channel to the dredged channel inside the shore line. A second cut which takes the depth of water down to 16 to 20 feet is being made by the dredge now. Spoil from the dredging was used to fill a low section near the bay front and to build an artificial island to protect the channel entrance from wave wash. Ninety feet wide on the bottom and 12 feet deep, the inner boat channel is ample for all small commercial boats an yachts and is being used now by deep water fishing vessels and yachts. Visible in this diagonal aerial is the smoke from the dredge as it works to widen and deepen the channel. 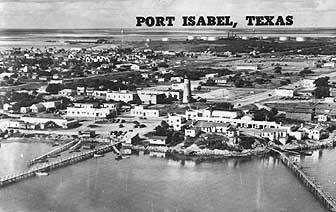 A brief history of Port Isabel's Waterways.